Reviews Reviews Reviews! : Star Trek: The Next Generation - "Quality of Life"
Star Trek: The Next Generation - "Quality of Life"
A scientist accidentally makes little sentient pet robots so Data has to stick up for their rights. 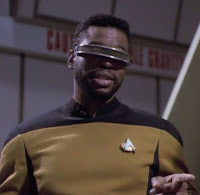 Also Geordi grows a beard!